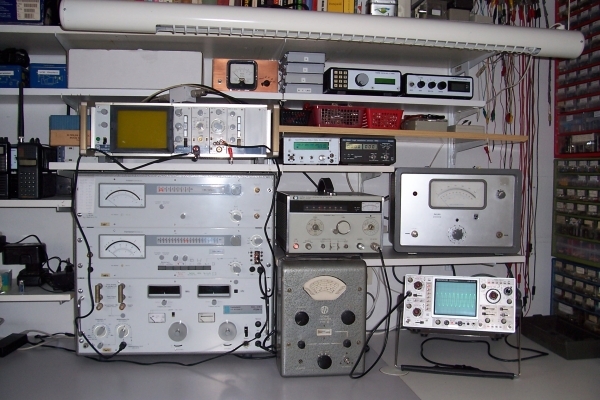 This page describes my home made measuring equipment. Most of the equipment is designed by others, so I have added (if available) the website URL of the designer. I also put some photographs near the article to show you what my home brew looks like (hi). After attending a lecture of Cor, PA0CHN about testing the performance of HF receivers, I decided to make some test equipment to put my new DC Transceiver under test. For IP3 testing, I needed a dual frequency generator, so I built one myself by means of Cor’s design. First the original software had to be disassembled to found out how it really works. Next, the entire program had to be made more efficient (because of the available memory space), and modified for the LCD that I should use. In ‘Elektuur’ (Elektor) of October 2002 an article was written about the construction of a PIC controlled RF Watt meter. I found the design earlier on the site of OZ2CPU and I bookmarked it then for later use…. That moment was here and I ordered the print and software and got to work. Because the need of measuring frequencies in the GHz range, I added an extra logarithmic detector (AD8318) board, designed by F6BON. Because of the need of a accurate frequency standard, I build a GPS controlled OCVXO frequency standard for 10 MHz. Already a long time a Digital Attenuator and a RF Power meter was laying in my junkbox doing nothing.. So I decided to put both modules together in a small case and added an Arduino Nano and OLED display to it. Here you can see my test bench. 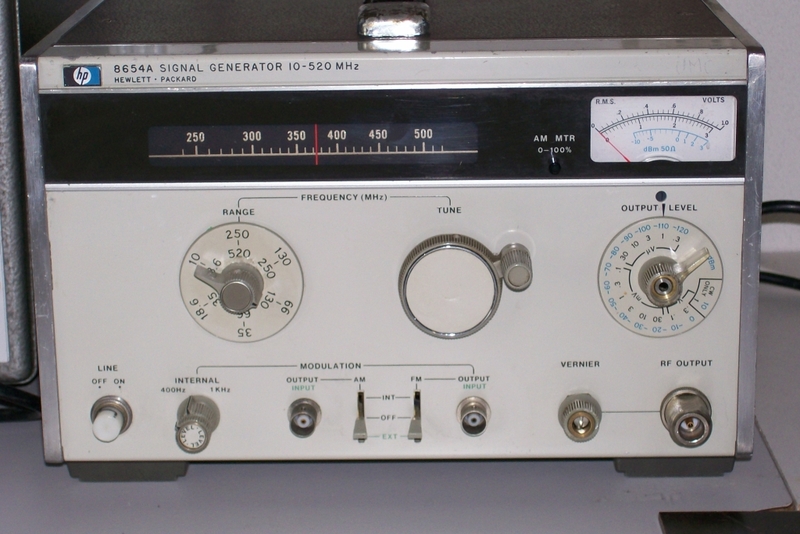 Philips 1 GHz frequency counter (PM6668). I have repaired the broken 8-digit LCDisplay with two 4-digit displays. 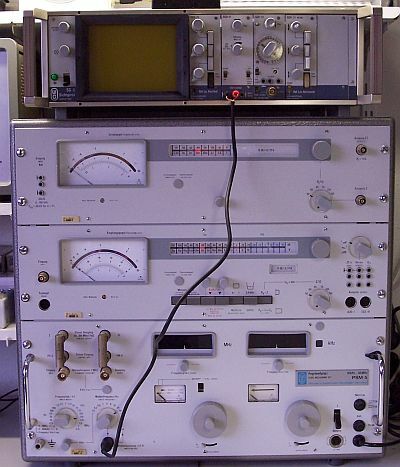 AVO signal generator type III, 150 KHz – 220 MHz. This is an old generator equipped with one tube, but still working excellent. 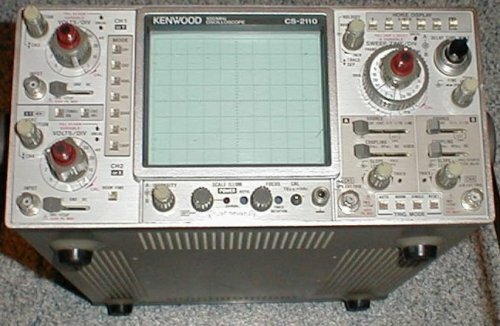 Kenwood CS2110 100 MHz scope (click for picture). Home made 1500 MHz frequency counter. Digital en analogue multi meters. Step attenuator with switches for 1,2,3,4,10,20 dB attenuation (Kent Electronics). HP Attenuators DC-1 GHz 355C (0-12 dB) and 355D (0-120 dB). RF impedance measure bridge (Kent Electronics). Panorama receiver 40-860 MHz (Kent Electronics). In-line monitor 33dB down (PA0CHN). Digital Attenuator + Power meter (Arduino controlled).